I saw this fun blog "carnival" on Sarah Denley's and Ashley's blogs, so I thought I would join in. If nothing else, it will encourage me to blog each day (even when I have no time/energy to!) I missed yesterday, so today's post will have days one and two. There will be a new post/topic for each day in the month of August. Some days the answer to the question might be included in my post, and other days it might deserve a post of it's own....we'll see. 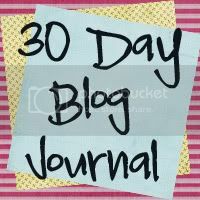 If you want to see the list of topics or join in the fun, head over to Emily's blog to link up. I honestly have no idea. I love a lot of praise and worship music, pretty much every Christmas song ever, and of course many, many old hymns. If I had to name a few of my favorite hymns I would probably choose "The Old Rugged Cross," "How Great Thou Art" and "This is My Father's World" - but there are oh so many more! Another confession: I don't really care for movies. I couldn't tell you the last one I watched. I just have never really been much of a movie buff. I have a handful of movies that I really like and I will usually just watch them over and over instead of ever seeing new ones. I'll see previews for movies and say, "ooooh, I want to see that" but when it comes down to it, I may want to see it, but I definitely don't want to pay $12 to see it. And by the time is comes out on DVD, I've long forgotten about it. If I had to choose a favorite movie, I would probably go with "Notting Hill" - Jeffrey and I used to watch it over and over while we were dating and it always makes me think of him. Plus Hugh Grant is not too bad either. ;0) And "Elf" always, always makes me laugh no matter how many times I've seen it.